June 13, 2011 - The National Treasury Employees Union (NTEU) has moved quickly and forcefully in an effort to ensure the Senate rejects two House-passed amendments that would seriously hurt not only the Transportation Security Administration (TSA) but the traveling public whose safety is largely in its hands. In letters to four key senators, NTEU President Colleen M. Kelley urged the Senate to exclude from its version of the fiscal 2012 Department of Homeland Security (DHS) appropriations bill language that would prevent funding to implement collective bargaining rights at TSA and strip nearly $300 million in agency funding. That reduction in resources would result in the loss of 8,000 TSA jobs. Moreover, the loss of collective bargaining rights ?would deal a significant blow to morale at the agency,? President Kelley wrote. 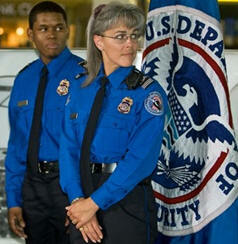 She added: ?Poor morale at TSA contributes to inefficiencies at the agency. "Poor workforce management has led to one of the highest attrition rates in the government, and high on-the-job injuries. Concerns have been voiced about increased costs and potential security gaps in our aviation systems because of this turnover and job dissatisfaction.? The NTEU leader voiced her serious concerns in letters to Sen. Daniel Inouye (D-Hawaii), chairman of the Senate Appropriations Committee, and Sen. Mary Landrieu (D-La. ), chair of the Appropriations Subcommittee on Homeland Security. She buttressed that effort with companion letters to Sen. Joseph Lieberman (D-Conn.), chairman of the Senate Homeland Security and Governmental Affairs Committee, and Sen. Daniel Akaka (D-Hawaii), chairman of the Homeland Security Subcommittee on Oversight of Government Management and the Federal Workforce. In her letters to Senators Lieberman and Akaka, President Kelley emphasized the importance of their leadership positions on the Homeland Security Committee, which is primarily responsible for DHS and TSA policy and their strong and ongoing support of an effective TSA?including collective bargaining rights and asked them to express to Senators Inouye and Landrieu their firm opposition to these amendments. She noted that, after a long effort led by NTEU, TSA Administrator John Pistole in February granted collective bargaining rights for TSA employees. ?These employees need a voice in the workplace, just like Customs and Border Protection (CBP) Officers, who are represented by NTEU at DHS,? she wrote, noting the senators? support for the successful NTEU-led drive to defeat an effort by Sen. Roger Wicker (R-Miss.) shortly after the Pistole action to eliminate those rights. As to the other dangerous amendment, it was introduced by Rep. John Mica (R-Fla.) and would effectively reject the idea that passenger and baggage security screening is an inherently governmental function. The Mica language seeks funds to privatize the security workforce at the nation?s airports, and would provide the funds to do so by cutting TSA resources. ?TSA has opposed the cuts, indicating that they seek a seamless security system that is more easily achieved with federal employees,? Kelley wrote. ?Cuts of this magnitude are unwarranted and will damage the traveling safety of the public. It will have a significant impact on TSA Officers? ability to do their jobs.? NTEU has long been involved in an active and successful organizing campaign among TSA Officers and represents thousands of them at airports across the nation. A union representation election to choose an exclusive representative currently is underway; it will end on June 21, with the votes to be counted by the Federal Labor Relations Authority on June 23.